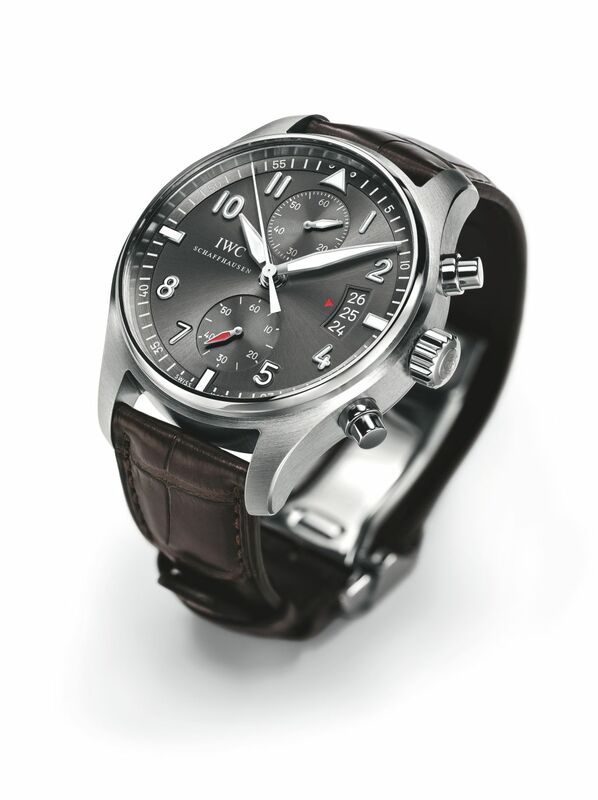 Since its initial launch in 2006, the Spitfire Chronograph from IWC Schaffhausen has enjoyed increasing popularity. Now, with its slate-coloured dial, it has an attractive new face and, with the IWC-manufactured 89365 calibre, a drive that leaves nothing to be desired. Back in the 1930s, when the Spitfire was first designed, the Royal Air Force was something of a social institution: a club for young bloods from good families who dressed with style and elegance and cut a dashing figure at the endless rounds of events they attended. Classical elegance and technological development are also the hallmarks of the new Spitfire Chronograph Pilot’s Watch models. For the first time ever, IWC is releasing a regular Spitfire Chronograph in an 18-carat red gold case. References 387802 and 387804 are available in stainless steel. The surfaces of the case are hand-polished until they gleam with a high-gloss or silky matte sheen, which gives them a particularly valuable-looking finish. Thanks to the sunpattern finish, the way in which light is reflected from the slate-coloured dial is especially vibrant. The intricate engraving on the back depicts a Spitfire and derives some of its appeal from the interplay of the differently machined surfaces. The dark colour of the dial and the date display in the form of an altimeter give the Spitfire an appearance closer to the classical Pilot’s Watch instrument look. The diameter of the chronograph cases (water-resistant to 6 bar) has increased by a modest 1 millimetre to 43, which has further improved legibility. 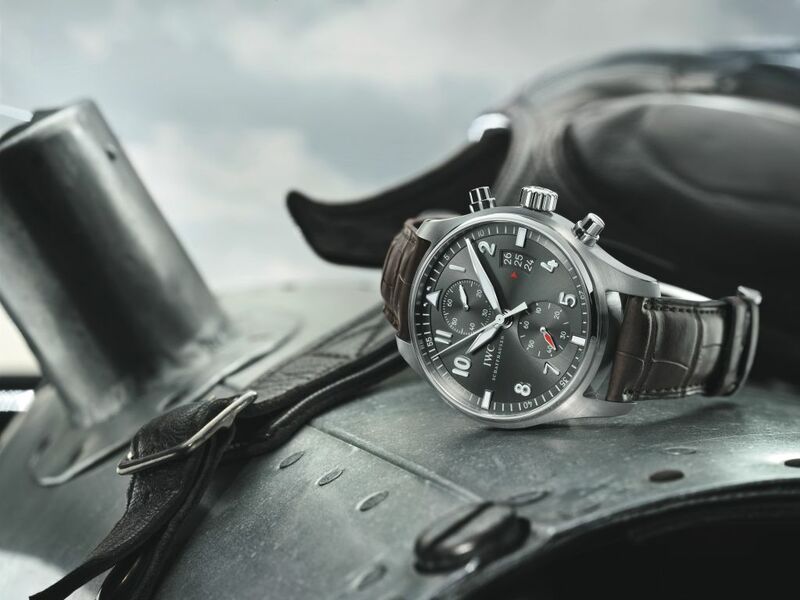 The Spitfire Chronograph is fitted with the IWC-manufactured 89365 calibre, which boosts its power reserve from 44 to 68 hours when fully wound. At the same time, the new movement has a flyback function, a mechanism that enables an ongoing time measurement to be “deleted” without an intermediate stop whilst a new one is started. It originates from the early days of aviation and a time when it was necessary to fly certain curved radii according to time. The hands are reminiscent of propeller blades in terms of shape and completely coated in luminescent material. The subdial at “12 o’clock” shows the recorded minutes while the seconds can be read off from the central hand. The red permanent seconds hand in the subdial at “6 o’clock” indicates that the watch is running normally. The sapphire glass has antireflective coating on both sides and is secured against drops in pressure. The red gold version has a brown leather strap with a classical pin buckle. The model in stainless steel comes with the newly developed stainless- steel bracelet, whose fine-adjustment clasp enables the length to be changed as required. The design of the pin buckle and folding clasp has been modified to accommodate the increased diameter. Features: Mechanical chronograph movement, self-winding, date display, stopwatch function with minutes and seconds, flyback function, small hacking seconds, screw-in crown, glass secured against displacement by drop in air pressure.